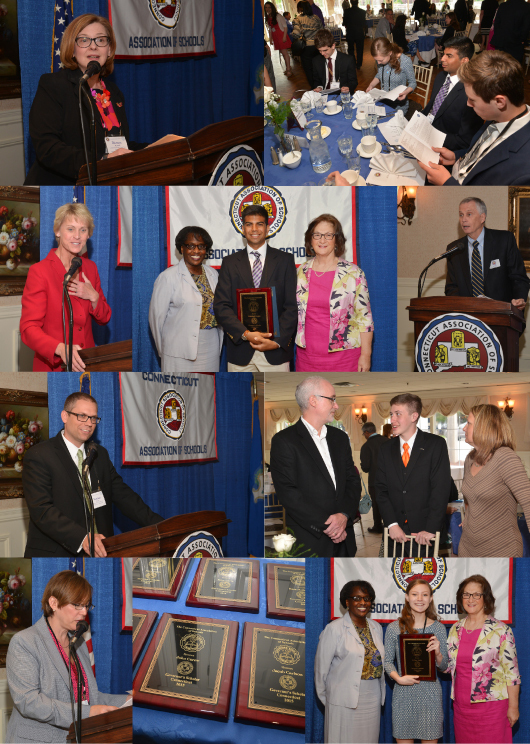 Thirty of Connecticut’s top juniors were honored at the Nineteenth Annual Governor’s Scholars Luncheon at the Aqua Turf on May 21, 2015. Sponsored by CAS, the purpose of this program is to recognize high-achieving, academically gifted students in high schools throughout the state. Each of the CAS member high schools may nominate one junior in the top 5% of his/her class to enter the Governor’s Scholars competition. This year, each nominated student responded in writing to the essay prompt, “Identify a recent controversy in which individuals’ interests or rights were at odds with the beliefs of the majority. With respect to that controversy, take a position as to whether or not society successfully balanced the rights of individuals and the rights of the majority. Explain your position.” Members of the Governor’s Scholars Committee, educators throughout Connecticut, chose scholars on the basis of their response to this prompt as well as other factors such as class rank and grade point average. In addition to receiving a plaque, each Governor’s Scholar is offered numerous gratis academic opportunities by various colleges and universities throughout the state; and, each Governor’s Scholar may be eligible for a University of Connecticut Academic Excellence Scholarship. Donna Schilke, president of the Connecticut Association of Schools and principal of Smith Middle School in Glastonbury welcomed guests and the scholars and their families, describing the demanding selection criteria for the award: “The competition, since almost every high school nominates a candidate, is intense; and the process leads to the selection of an elite group designated as Governors’ Scholars.” Dianna Wentzell, Connecticut’s Commissioner of Education, congratulated the scholars and expressed the hope that they would make important contributions throughout their lives.